MOORESVILLE, NC (January 15, 2019) — Lucas Oil announced today that its longtime relationship with Pat Musi Racing Engines and Musi Racing will continue for the 2019 season on a number of different fronts. Lucas Oil will share the primary sponsorship with Edelbrock on Frank Brandao’s record-setting Pro Nitrous 2018 Dodge Dart driven by standout driver Lizzy Musi, while the partnership will also extend into the engine shop for Pat Musi Racing Engines. The company has proudly used Lucas Oil’s proven products for more than a decade with an impressive track record. At Pat Musi’s highly-successful engine shop, Lucas Oil is the lifeblood for every Musi engine. 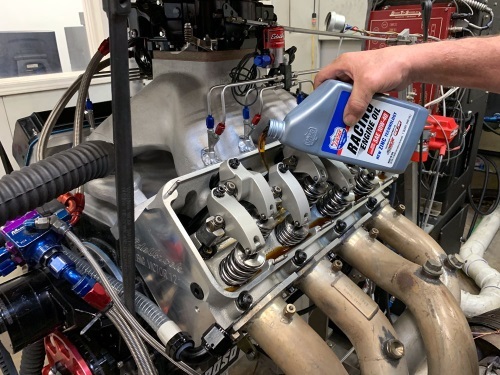 That will continue in 2019, as Pat Musi Racing Engines will use Lucas Oil’s 10w40 Racing Oil, 20w50 Racing Oil, 20w50 Break-in Oil and the new Low Viscosity Stabilizer this year to again stay a step ahead of the competition. Lucas Oil has long been directly involved in the American racing industry through multiple vehicle sponsorships and racing event promotions, at all levels. Seeing a need for better lubricants in this industry, the Lucas Oil people went to work again. The end result being a line of high performance engine oils and gear oils that are second-to-none in the racing industry. The Lucas success story has been built upon hard work, an unparalleled line of premium products and an unwavering commitment to customer satisfaction. This single formula for success will continue to guide Lucas Oil Products as it grows in the years to come. For more info, please visit www.lucasoil.com.